Pressing the power button on your computer usually isn’t too much trouble, unless your computer is stored away somewhere hard to reach. [Joonas] has been hard at work on a solution that would also impress his friends, building a knock sensor to turn on his PC. For around $10 in parts he put together an ATTiny45 that emulates a PS/2 device, which takes advantage of his computer’s ability to boot upon receiving PS/2 input. The build uses a Piezo buzzer and a 1M Ohm resistor as a knock sensor exactly as the official Arduino tutorial demonstrates, and one of those PS/2-to-USB adapters that are most likely lurking in the back corner of every drawer in your office. [Joonas] used AVRweb to disable the 8X clock divider so there’d be enough clock cycles for PS/2 communication, then loaded some test code to make sure the vibrations were being detected correctly. You can check out his Github for the final code here, and stick around after the break for a quick video demo. 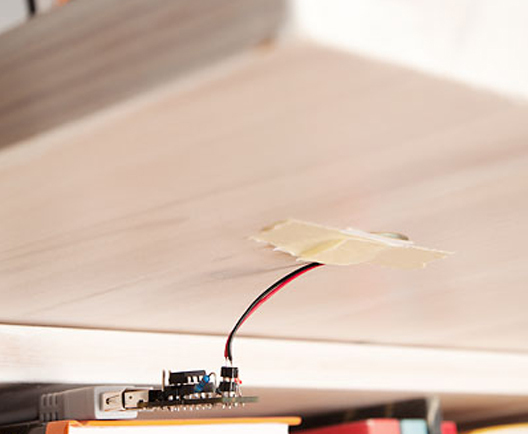 Then check out a similar hack with [Mathieu’s] home automation knock sensor. We’re introducing a new series on CAN and automotive hacking. First, we’ll introduce CAN and discuss how in-vehicle networks work. In 1986, Bosch introduced the Controller Area Network protocol. It was designed specifically for in-vehicle networks between automotive controllers. CAN became a popular option for networking controllers in automotive, industrial, and robotics applications. Starting in 2008, all vehicles sold in the US must use CAN. Modern vehicles are distributed control systems, with controllers designed to handle specific tasks. For example, a door control module would take care of locks and windows. CAN allows these controllers to communicate. It also allows for external systems to perform diagnostic tasks by connecting to the in-vehicle network. The engine control module sending the current engine speed to the instrument cluster, where it is displayed on a tachometer. The driver’s door controller sending a message to another door controller to actuate the window. A firmware upgrade for a controller, sent from a diagnostics tool. CAN is usually used with little or no security, except for the obscurity of the communications. We can use CAN to USB interfaces to listen to the traffic, and then decode it. We can also use these tools to send forged messages, or to perform diagnostic actions. Unfortunately, most of the tools for dealing with CAN are proprietary, and very expensive. The diagnostics protocols are standards, but not open ones. They must be purchased from the International Organization for Standardization. Next time, we’ll get into the structure of CAN frames, and how traffic is encoded on the bus. The key to this minimalist build is having the entire boot process controlled by an ATMega16 microcontroller, This interfaces to the 6502 through a dual-port SRAM, a 1 kilobyte Cypress CY7C130. This dual-port RAM allows the CPU and microcontroller to access the same bit of memory, making it easy to bootstrap a computer from a bit of AVR code. Output is provided with [Stian]’s ATMega video text generator putting a 37×17 characters on any television with an RCA jack. While input isn’t handled yet, [Stian] says it should be possible with his AVR PS/2 keyboard library. While other 6502 homebrew computers such as [Quinn Dunki] Veronica can reach unparalleled heights of complexity, there is a lot to be said about the minimalism of [Stian]’s three-chip computer. With some clever coding and a modified parts list, it may well be possible to put a retrocomputer in the hands of everyone with a bare minimum of cost and parts. For all the 3D printers that hit the Hackaday tip line, it’s surprising we don’t see more CNC routers. They’re arguably more useful tools, and with the ability to mill wood, plastic, and non-ferrous metals, open up the door to a whole bunch more potential builds. One of the most popular – and certainly one of the least expensive – CNC routers out there, the Shapeoko, just received a huge update that makes this minimal machine even more capable. The new Shapeoko 2 keeps the same V wheel on an aluminium extrusion design with Makerslide, but fixes a few problems that limited the original Shapeoko. There’s a larger work area on this version, and the Y axes feature dual stepper motors. The biggest feature, we think, is the ability to handle materials larger than the machine itself thanks to its open front and back. The Shapeoko 2 is available in two versions, a $300 mechanical kit that requires you to go out and get some motors, a power supply, and a grblShield, the full version, for $650, includes everything you’ll need to start routing wood metal and plastic at home. It’s no secret that we love to see project demos that pander to Hackaday. This often comes in the form of our page loaded on the screen in build photos, or creative use of our skull and wrenches logo. Now’s your chance to pander for a smidge of loot. [Phillip Torrone] offered up 20 of Adafruit’s new 5v Trinket boards as giveaways, and we can’t say no to getting free stuff in the hands of the readers. Preference will be given to the largest (can you put us on the side of a building?) and smallest (electron microscope anyone?) submissions. This contest is over, thanks to all who sent in their work! Send your submission details to our tips line (don’t forget to say something like [Trinket Contest] in the title!). In order to receive a prize you must include your name, address, and email address (these will only be used by Adafruit to deliver the hardware and notify you when it has shipped). Get your entry in by Friday, November 1st in order to qualify. Obviously Hackaday, SupplyFrame, and Adafruit employees and their families aren’t eligible to win. [Richard] recently rediscovered some files from a hack he did back in 2004. He was experimenting with exciting piano strings via electromagnetic fields. The idea shares some elements with the self tuning piano we saw back in 2012. Piano strings, much like guitar strings, are made of steel alloys. This means they create electricity when vibrated in a magnetic field. This is the basic principle upon which electric guitar pickups are built. The idea also works in reverse. The strings will vibrate in response to a modulated electromagnetic field. Anyone who has seen an E-bow knows how this can be applied to the guitar. What about the piano? [Richard] started with the Casio CZ-101, a classic synth in its own right. The Casio’s output was run through a Peavy 100 watt amplifier. The amplified output was then used to drive custom coils mounted on a piano. The coils had to be custom wound to ensure they would be compatible with the 4 – 8 ohm impedance expected by the amplifier. [Richard] ended up winding the coils to 28 ohms. Six of these coils in parallel put him just over the 4 ohm mark. The coils effectively turned the piano into a giant speaker for the synth. In [Richard’s] write-up (word doc link) he mentions that the strings basically act as a giant comb filter, each resonating strongly in response to frequencies in its harmonic series.